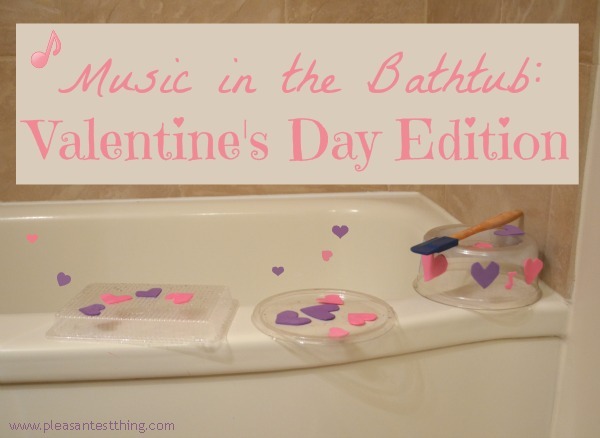 We’re sharing one more bath as part of the week-long Valentine’s Day bath series: Music in the bathtub! My boys love banging things in the bath. We bring measuring cups, various bowls and containers in frequently. They scoop and pour water, and usually wind up banging away. 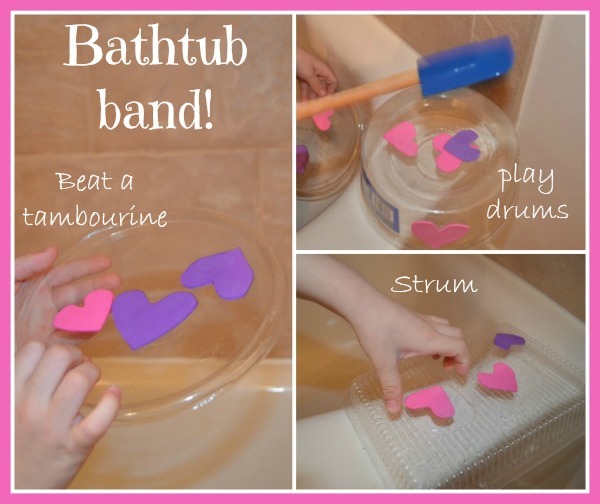 I started calling them the bath-time band, and then I realized that actually sounded like a lot of fun! I gathered a few containers from the recycling bin. One to bang with a spatula, a large lid to hit with their hands tambourine style, and a container with texture to scratch and make a fun sound. I cut pink and purple craft foam into heart shapes and glued some onto the containers. I also added some hearts to the bath, for the boys to put on the walls and on the tubs. I ran the bath and started our Valentine’s Day playlist. As predicted, the boys ran in, and started singing and banging away on the rock band set up.